Wouldn’t it be nice to have your very own bouncer who stands boldly outside your Devolutions Password Server instance and banishes anyone who isn’t on the VIP list? Well, you’re in luck, because by setting IP restrictions, that’s exactly what you’ll have! IP restrictions add an extra layer of security by enabling administrators to grant access based on specific IP addresses, IP address ranges, and/or geographic locations. 1. Log on to your Devolutions Password Server web interface. 2. 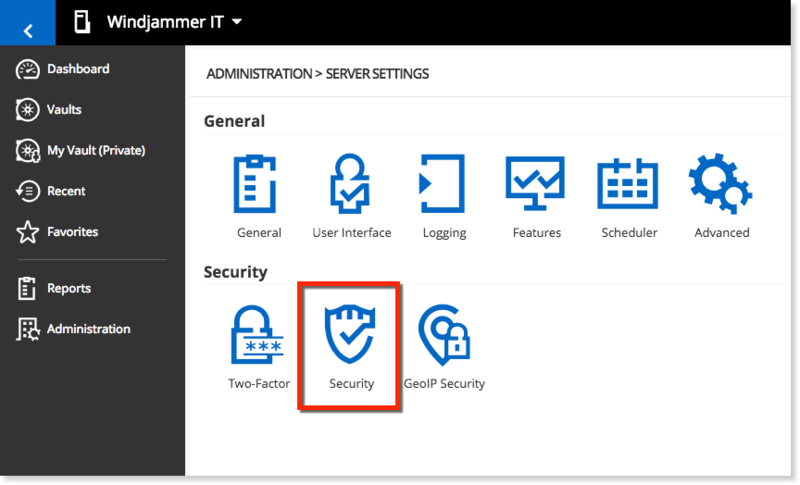 Navigate to Administration – Server Settings – Security. Allowed Single IPs: This will only grant access to specific IP addresses that are indicated in the field. All other IP addresses will be blocked. Allowed Masked IPs: This will only grant access to IP addresses that are indicated in the field (FYI: masked IPs separate the IP address into the network and host addresses). Denied Single IPs: This will block specific IP addresses that are indicated in the field. Any other (non-listed) IP addresses will be granted access. Denied Masked IPs: This will block specific masked IP addresses that are indicated in the field. Any other (non-listed) masked IP addresses will be granted access. Note: to specify multiple IP addresses, separate each one with a comma. For example: 192.168.01.01,192.168.01.99,192.112.0.0. What if you don’t know the specific IP addresses or masked IPs that you want to block, but still want to keep IP addresses from a certain geographic area from accessing Devolutions Password Server? No problem! You can configure the GeoIP security settings to grant access to IP addresses in specific locations (which is the same thing as blocking IP addresses in other specific locations). 1. Log on to your Devolutions Password Server web interface. 2. 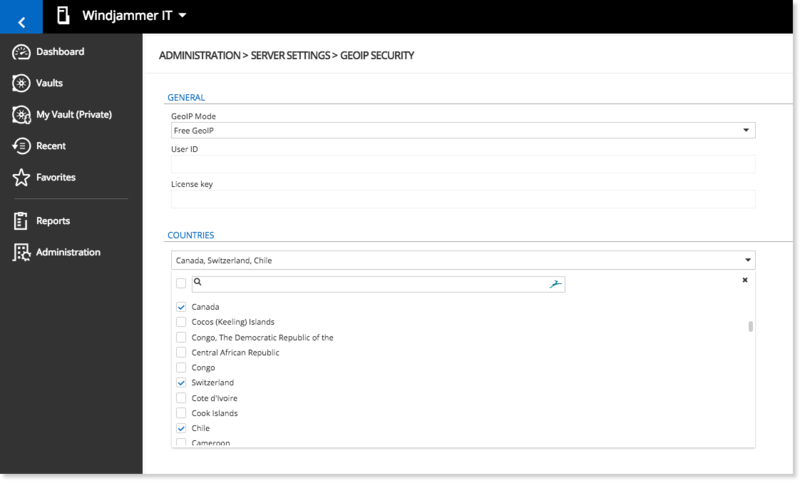 Navigate to Administration – Server Settings – GeoIP Security. None: This will disable GeoIP security. Free GeoIP: This uses the GeoLite database where you can look up a city, AS number or other information for an IP address. Then in Countries, select the countries that you wish to grant access to Devolutions Password Server. All IP addresses from other (non-listed) countries will be blocked. MaxMind: This uses MaxMind's GeoIP database to look up the city, AS number and other information for an IP address. Next, connect to your account by entering your User ID and License Key in the appropriate field, and then in Countries select the countries you wish to grant access to Devolutions Password Server. All IP addresses from other (non-listed) counties will be blocked. And that’s all there is to it, folks. Whether you want to grant or block access to specific IP addresses, IP address ranges, or IP addresses from specific locations, the tough and reliable virtual bouncer who lives in Devolutions Password Server awaits your command!